Since it also happens to be the end of the year, I complete this post with our end-of-year report, as we also did in 2016. 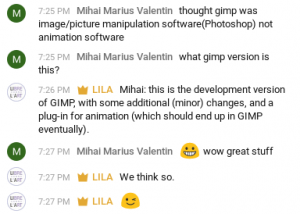 What we did for GIMP 2.9.8! During this release span, I focused most of my efforts on bug fixing. I finished a few features here and there but actually even restrained myself from coding too many new stuff! Why? Because I believe we have enough and at some point, we should just release GIMP 2.10. Of course, GIMP 2.10 could be even twice as awesome if we push it by a few more months, and 5 times more awesome with even more time. But then in the end, if you never see it, what’s the point, right? Actually I even plan on just doing this (bug fix and finishing what was started) until we get 2.10 out. Let’s stop feature craziness! Apart from a lot of bug fixes, I did a lot of bug triaging these last months (looks like I participated in 122 bug reports between 2.9.6 and 2.9.8, i.e. 3 and a half months). And this month, I also reorganized our bug tracker still for the same reason (pushing GIMP 2.10 release forward) by reviewing the 50+ bugs we had in the GIMP 2.10 milestone to set as blockers only the ones we should really look into. Right now that’s down to 25 such bugs! I also put some efforts in our stable flatpak release, which is how since October 16, GIMP has officially had its flatpak package on flathub! 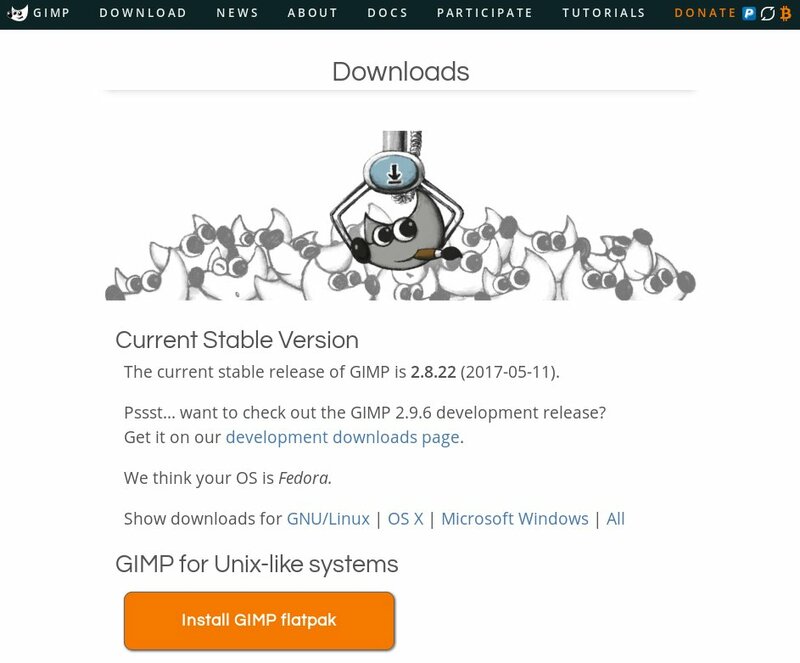 It is of course visible on the GNU/Linux section of GIMP’s download page with a nice “Install GIMP flatpak” orange button (notice also the cool drawing on this page? That’s Aryeom’s!). Right now, you can only install the stable release, i.e. GIMP 2.8.x (flathub only accepts stable builds) but if you get it there, when GIMP 2.10 will be out, you will automatically get an official update! In any case, this flatpak thing (in particular keeping our development flatpak manifest up-to-date with git code and testing the builds) is taking a lot of maintenance time! 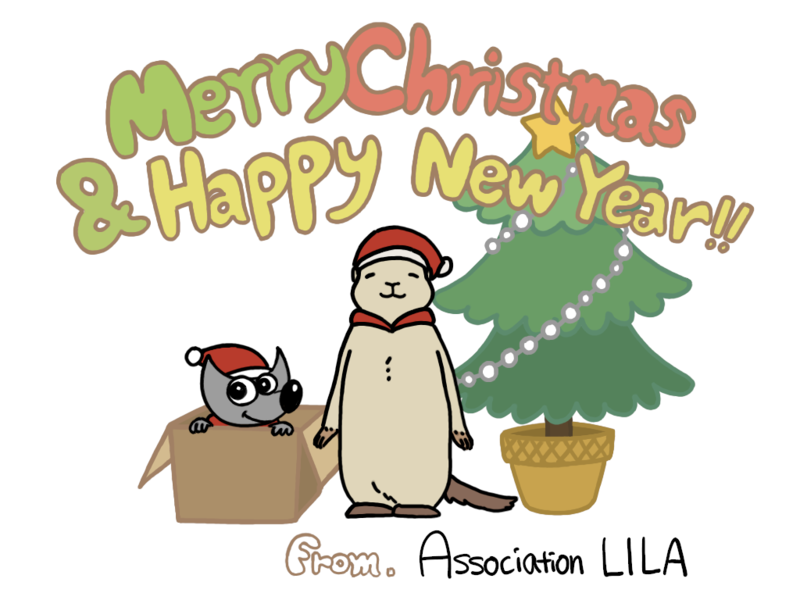 We also had again 2 guest commits by Lionel N., board member of LILA association, the non-profit managing ZeMarmot project. Support of password-protected PDF for import (the 2-commit feature implemented by Lionel from LILA!) and new procedure `file-pdf-load2()` API for plug-ins and scripts to open password-protected PDF files, but also multi-page PDFs (loading a multi-page PDF was already possible through the GUI but not by scripts and plug-ins). 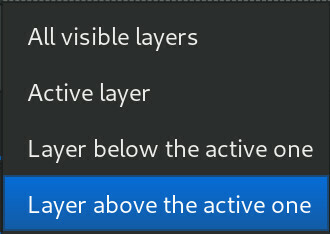 Help system improvements: upon detection of locally installed manuals in several languages, GIMP will now allow selection of the preferred manual language in the Preferences dialog (Interface > Help System). I felt this was an important feature because we regularly had people not understanding why the manual they installed was not seen by GIMP. And they were right, especially since we don’t have as many manual languages as GUI languages. For example, we have 3 Chinese translations (zh_CN|TW|HK) but only a zh_CN manual. I could definitely imagine someone with a zh_HK GUI to go for the zh_CN manual as a fallback. Verbose version (command line: gimp -v) now displays C compiler information (useful for debugging). 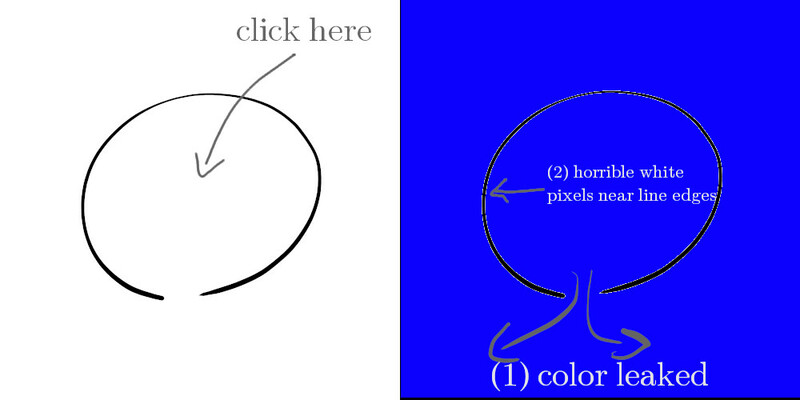 Color picker implementation for KDE/Wayland. Improve delay handling for screenshots. Review HGT support patches and improve a bunch of stuff with auto-detection of the format variants (SRTM-1 and SRTM-3), and also a `file-hgt-load()` API for scripts and plug-ins. But really, as I said, I think my bug fixes and maintenance of previous code was actually much more important than this above list, even though it is so less fancy (and I am a bit sad I cannot list bug fixes in a non-boring way!). And I will just focus more and more on fixes and stability to get GIMP 2.10 out as soon as possible. 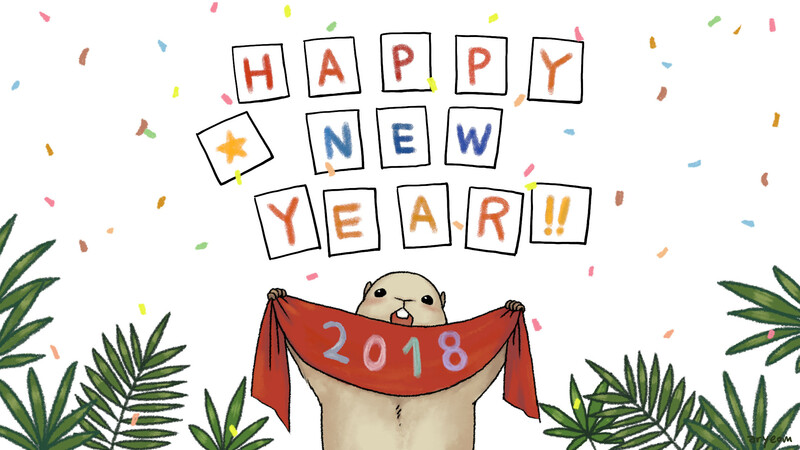 ZeMarmot in 2017: our report! 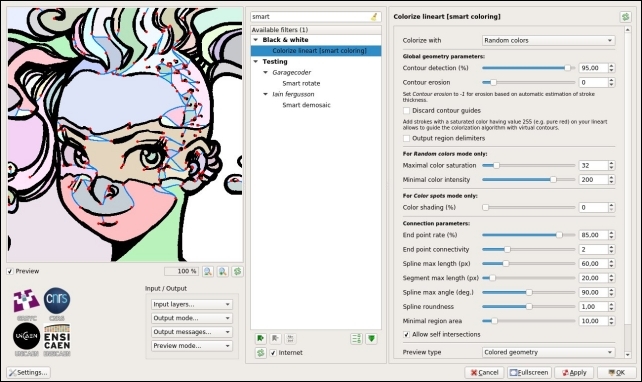 You know it, ZeMarmot is not only about GIMP, even though this software is a huge part of it! 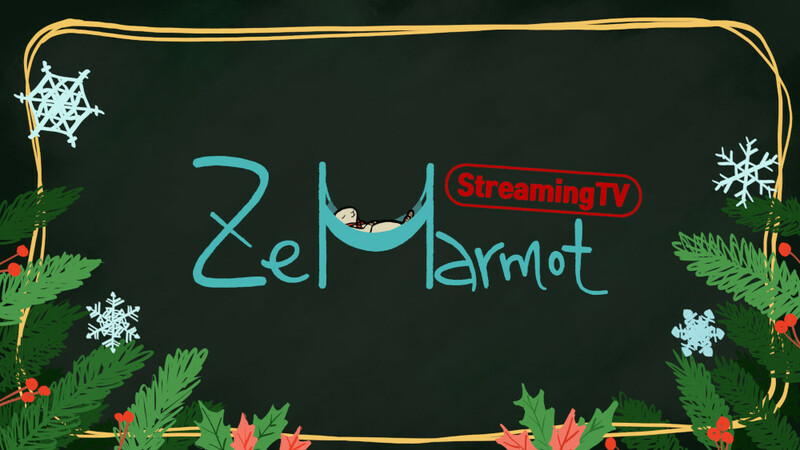 ZeMarmot is about making an animation film in 2D drawing, traditional animation yet with digital means (i.e. drawing on computer, not paper). We draw with GIMP. Well Aryeom Han, animator and animation film director does so (not me). And we crowdfund this project. This year was a bit tough mentally and we really started to wonder if this project was a good idea for our lives. Project finances increased continuously yet very slowly, and were still extra low all throughout 2017 (under 400 € a month). In October, I finally shouted a cry for help after my computer broke, and we are so happy that many people heard it! The funding increased by about twice. Now let’s be clear! Our current funding is more or less 1000€ since October. This is a lot better than what we had before and it gave us a lot of hope. Yet it still does not pay full time salaries for 2 people (faaar from it, actually it cannot even pay a single full time salary obviously). So we still hope you will not forget us and if you appreciate our project and what we do, both on GIMP development and/or on ZeMarmot movie, please we will be very thankful if you can donate to the project. We were conscious that the lack of news on the animation side was not the best. On the other hand, animation just takes time. That’s the way it is. Depending on the complexity and details of the animation (as chosen by the team), a minute of animation can take a month of work or more (just search the web, all links say the same). Of course, it depends on your artistic choices. If you do vector animation or Limited Animation (Simpsons or the likes), you can animate a lot faster. Basically you don’t take the same time to animate South Park or a Disney movie (which is not a problem, it’s a choice; I appreciate The Simpsons or South Park too). 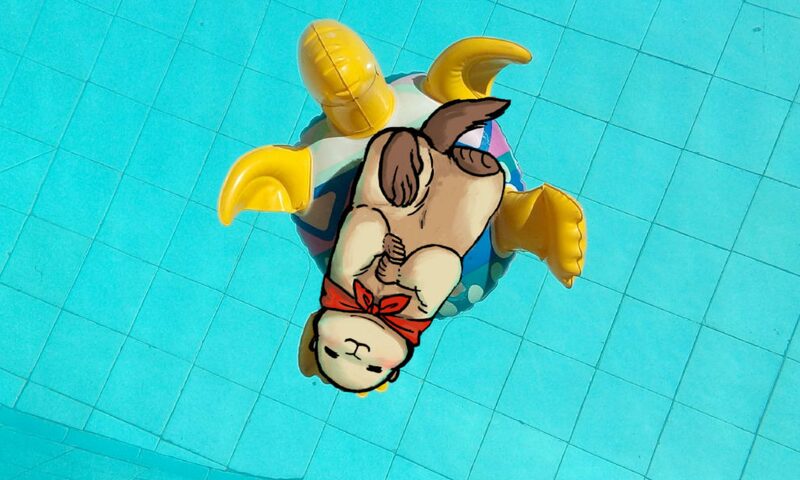 For ZeMarmot, as you know, we chose a detailed style with full traditional animation. At times we regretted this choice a bit but that’s the way things are. That’s how Aryeom decided to live stream herself working! She took a few days to search software and found the Free Software OBS, understand how things work (well she also managed to break Fedora once by reinstalling NVidia drivers while following tutorials! :p), made many tests throughout December and since December 25, public livestreams started. Unfortunately we have not found the right organization yet to plan and give a schedule of future livestreams. So for the time being, the best is either to follow us on Twitter, subscribe to the Youtube channel, or just try to have a regular look at above link. 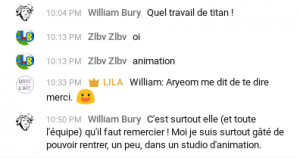 Still I think that’s an awesome experiment and we already had some very cool comments, like people thanking us (some in English, many in French) because that it is a bit like being allowed to sneak into an animation studio to observe the animators working. Answer: because this project is a whole. It is symbiotic: I do Free Software because I use it; if I didn’t have ZeMarmot (or another project where we use GIMP), then I would likely not contribute to GIMP. It is that simple. Aryeom as well would likely not use GIMP if she didn’t have a developer by her side. We remind that is how I started my first patches: because we had crashes and many issues with GIMP and this was not enough for us as a professional tool at the time. We are very happy to tell you that now, it is. Not only because of us, far from it, let’s be clear! We are so happy to hack together on GIMP with several very talented developers (among them, Mitch, GIMP maintainer who is still here after 20 years!). But we were allowed to do our part and this is the reason we stuck around. To illustrate, just a few hours ago, thanks to Aryeom’s streaming of her work, we were able to have an unexpected live demo of how well we work together. During her live, GIMP crashed! Ouch! In a few minutes, she was able to find reproduction steps during the live streaming. Less than two hours later, I fixed the crash then improved my fix in the master repository of GIMP (it actually took even just a few minutes to reproduce and fix the crash, but well I also had other priorities which I could not drop immediately!). So if you ever hold your donation because you only want to pay for a movie, or at the opposite only want to pay for GIMP development, I hope you will review your judgment and see why you get to your goal even better by paying for both! GIMP Motion is our plug-in for animation in GIMP (we talked about it earlier for simple then complex animations). You can also see it in action in Aryeom’s live streamings by the way, nearly daily now. That means that GIMP Motion will likely not be a part of GIMP 2.10. Yet it will be a part of a further GIMP 2.10.x release since we decided earlier that we would relax the no-feature policy on minor releases, which is how I decided that GIMP Motion was not ready to be part of a stable release. That’s exactly why I pushed for this no-feature policy relax for years (ever since 2014, cf. the section “GIMP Meeting(s)” on our LGM 2014 report! ): so that we don’t have to rush half-done features nor push important releases forever. Well we still use it internally, but that’s still very very rough and has many bugs. Be warned if you try it! This year, we have been a bit light on documenting the process. Well we had a post on animatics, key-framing, etc. and one on background design. 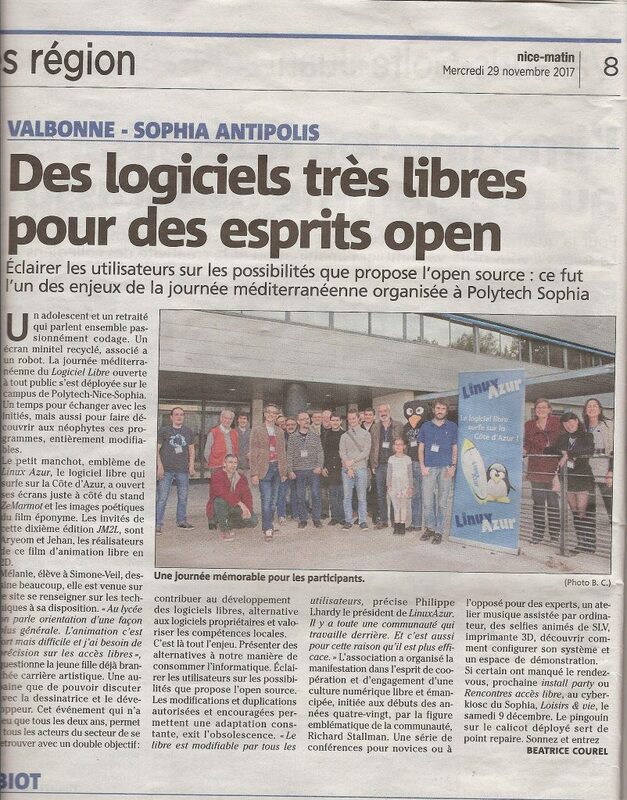 We also had a few talks during the NUMOK festival in Paris, as well as in the JM2L meeting in South of France where we could give some interesting details on the process as well which are not written here yet (but should be soon). I am the first to admit that’s not enough since Aryeom and I really want to document the techniques behind giving life to still images. But as I said, we had been a bit down, overworked and penniless this year so this fell a little behind. Hopefully we’ll do better next year. Thanks to the increased funding at end of year, we were able to renew a bit our material. 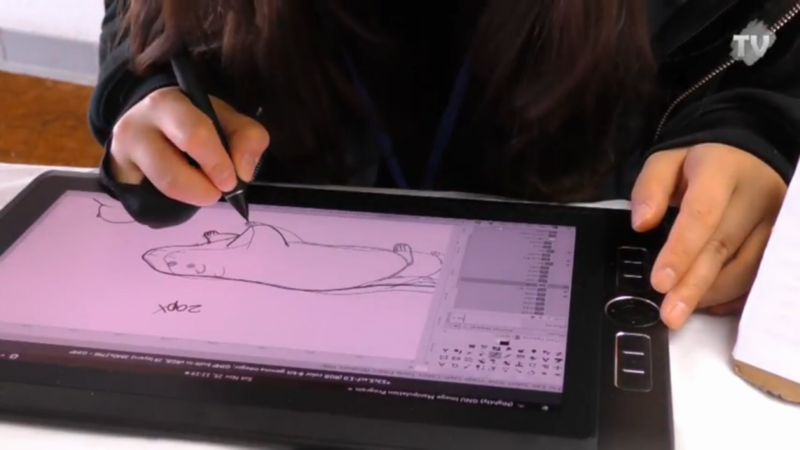 In particular we bought a Wacom MobileStudio Pro (basically a laptop-tablet from Wacom) on which the first thing we did was to erase Windows and install a GNU/Linux (Fedora 27) and GIMP. And that worked well. We still opened more than a dozen of bug reports here and there, so don’t expect things to be perfect yet. But we are working on it! We documented a bit our process on a Twitter moment and unfortunately had to take a pause because of hardware issues. We indeed had to send the tablet back to after-service, which gave it back after more than 3 weeks (2 days ago)! This year was hard but eventful, and the end of year gave us more hope after funding increased and we were able to upgrade our material. 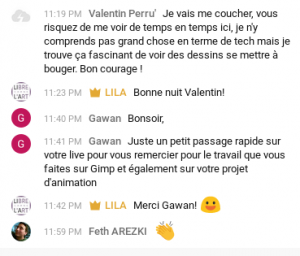 The streaming of Aryeom GIMPing was also a very cool idea and we are happy to see that people seem to like it. To this day we only got positive feedbacks. We should have started this sooner! We do hope that things will continue to improve. 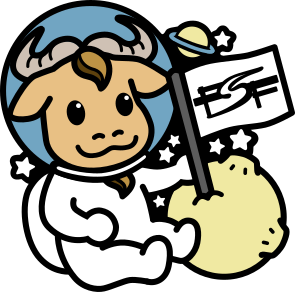 We love what we do and our project, and we really wish we will soon be able to say proudly that we are able to make a living by hacking Free Software and Libre Art. Too long, didn’t read? 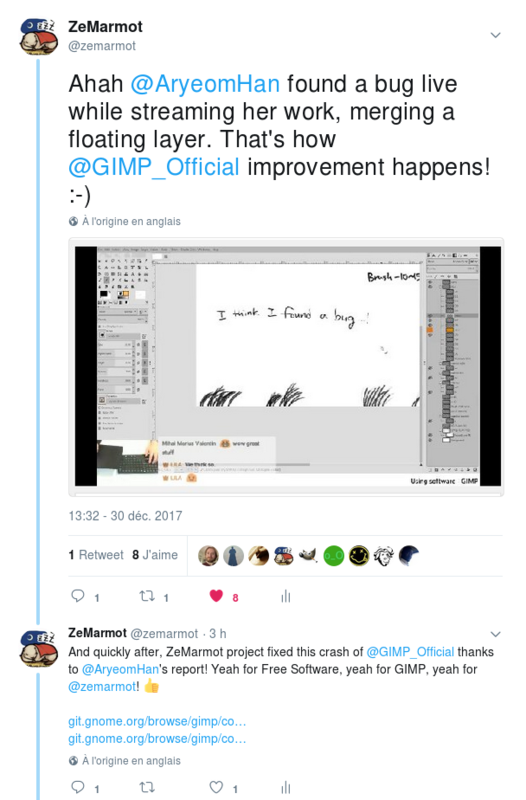 In a few words: our GIMP development + ZeMarmot production is currently funded barely above 400 € per month, this doesn’t pay the bills, my main computer broke today and Aryeom’s graphics tablet has been working badly for some time now. We are a bit bummed out. So we call for your help! You can fund GIMP development and ZeMarmot production on Patreon or Tipeee! If you read us regularly, you know that I am hacking GIMP a lot. We are just a handful of regular developers in GIMP, I am one of them. My contributions go from regular bug fixes to bigger features, maintenance of several pieces of code as well as regular code review from contributed patches. 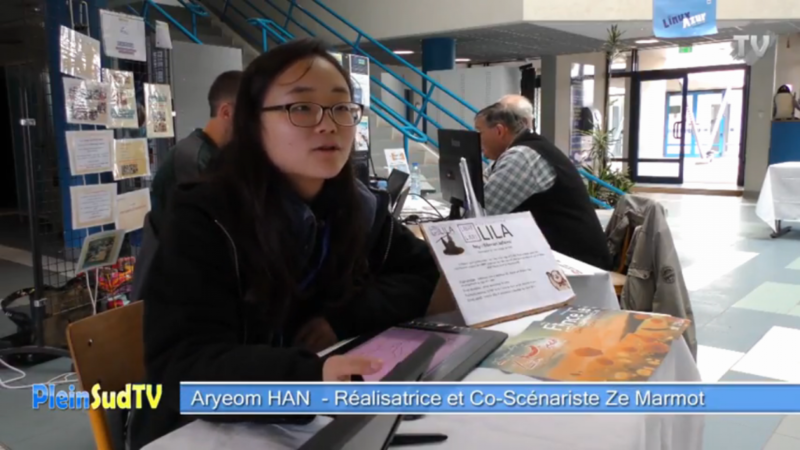 I do this in the context of ZeMarmot project, with Aryeom Han, director and animator. 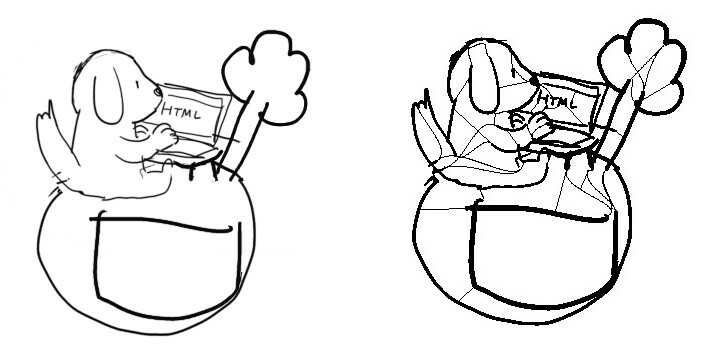 We draw on and hack GIMP because we believe in Free Software. On the side, I also contribute to a lot of other Free Software. Our absolutely-not-hidden goal is to be able, one day, to live from hacking Free Software and creating Libre Art. But clearly there is no denying that we are currently failing. With about 400€ a month for 2 people, association LILA can barely pay a few days a month (by the rules, which means a good part of the sum even goes to non-wage labour costs). These 400€ are not even the monthly rent we pay for our 1-room flat (31 m², in the far suburb of Paris); so you would assume well that we don’t live from it. We mostly live off savings and other things to pay the bills. These “other things” also use time we would rather spend on drawing and coding. 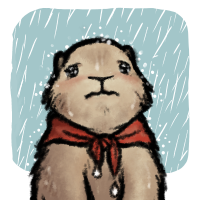 We would indeed enjoy working full-time on ZeMarmot, creating Free Software and Libre Art for everyone to enjoy. But we are very far from this point. The main reason why we have not stopped the project already is that we promised we’d release the pilot. Funders are counting on us. Of course the other reason is that we still hope things will work out and that we will be able to live from what we love. Still the project is done at slow pace because we can’t afford to starve, right? So we are at times demoralized. This is why I am doing this call. If you can afford it and believe that improving GIMP is important, then I would propose to fund ZeMarmot which supports paid development. 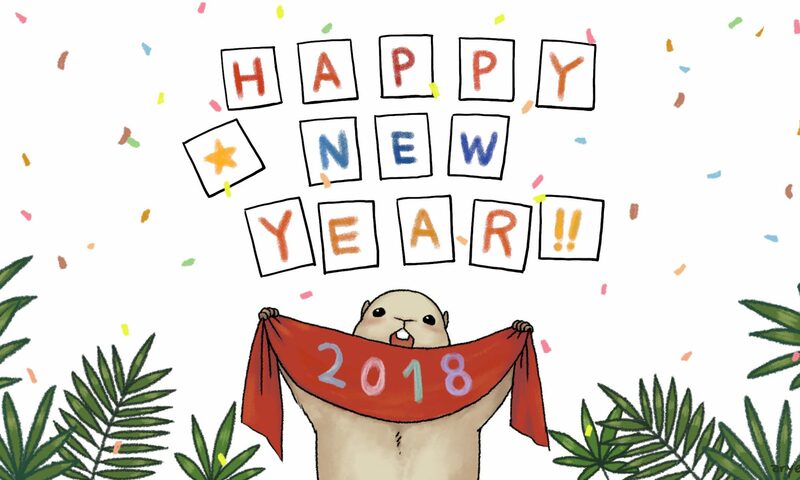 Similarly if you want to see more Libre Art, and in particular cool animation films, and maybe later other movies under Libre licenses in professional quality, then I again propose to support ZeMarmot. And so why is this post released today? The situation has been hard for months now, but today it is dire: my laptop just broke. It just won’t turn on. All my data are safe since I do regular backups (and I think the hard drive is still ok anyway), but I don’t have a computer anymore to work on (I am writing this on a 8-year old 32-bit netbook which barely stands opening a few browser tabs!). 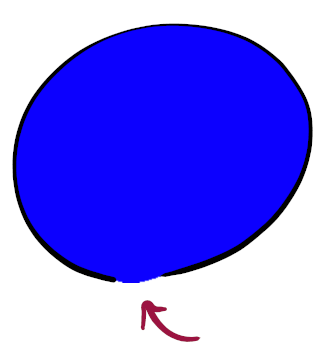 On her side, Aryeom’s graphics tablet has had issues for months. As you may remember, we partly dealt with them, but the tablet regularly shuts down for no reason, we have to remove and put back the battery or similar annoying “workarounds”. And we fear that we have to buy a new one soon. So that’s what triggered this blog post because I realize how precarious is our situation. We barely get funding for living bills, we eat our savings and now we have (expensive) material issues. 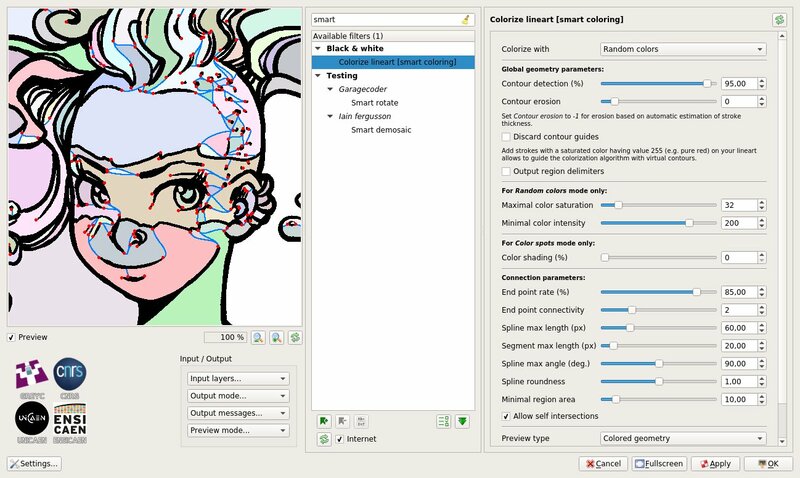 So we are calling you all who like Free Software and Libre Art. Do you believe ZeMarmot is a good thing? Do you believe our project has any meaning and that it should continue for years and years? We believe this, and have believed it for the last 2 years where we have been trying. If you do too, maybe help us a bit, relatively to your means. If you really can’t afford it, at least you can spread the word. 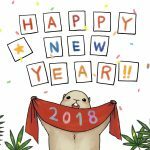 ZeMarmot is a wonderful experience for us, and we really don’t want it to have a bitter end (though we won’t regret a second of it). Mid-July, we finally published publicly the code of GIMP Motion, our software for animations in GIMP. It is available on GIMP official source code repository under the same Free Software license (GPL v3 and over). So it means that for the time being, if you want to play with it, you will have to build it yourself from source, or wait for someone to make a build (we may provide one at some point). The video above describes some of the base features for simple animations, such as storyboards/animatics and most common needs for animated images (GIF, Webp…). 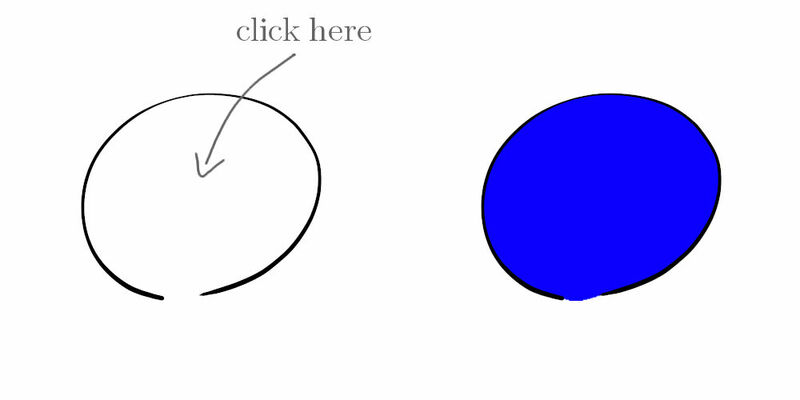 What we call “simple animations” is when you mostly have several images which you want to succeed at one another. No complex composition with background and character layers for instance. New features will still happen, for instance for panning/tilting/zooming on bigger panels (very common on storyboards as well), and adding various effects (a keyframed blur for instance would be a common movie effect). USD on Patreon or in EUR on Tipeee. 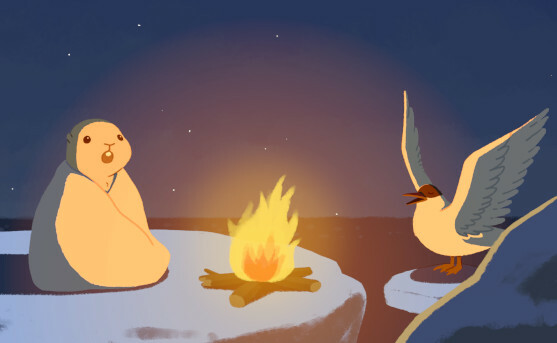 In an animation film, obviously the design does not refer only to characters. There can be props design when applicable, and of course background design. As an example, the most interesting case is how we designed ZeMarmot’s home! 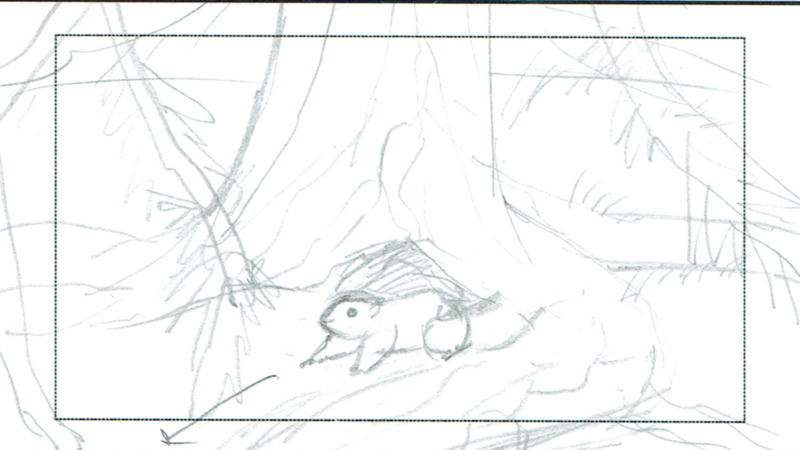 At least the outside part of its burrow, since we never see the inside (unlike in the initial comics attempt). You remember the first research trip? 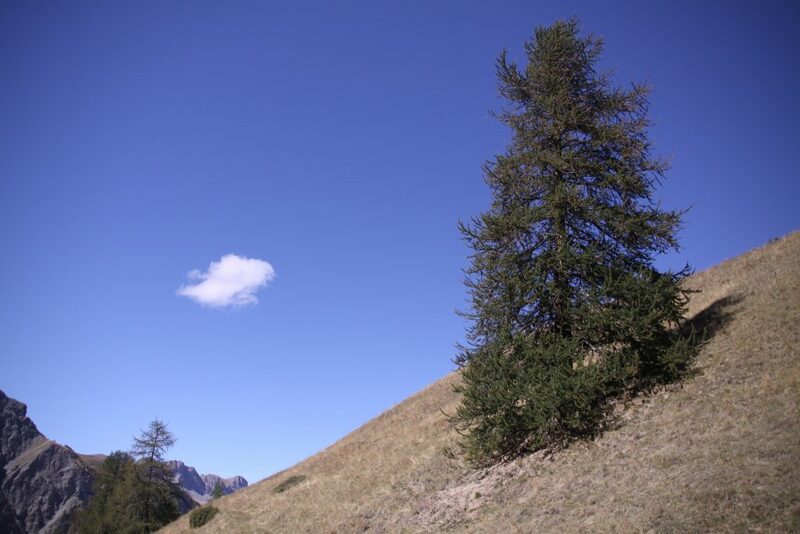 Back then, we found this nice hill, next to Saint-Véran village with just a single tree in the middle. 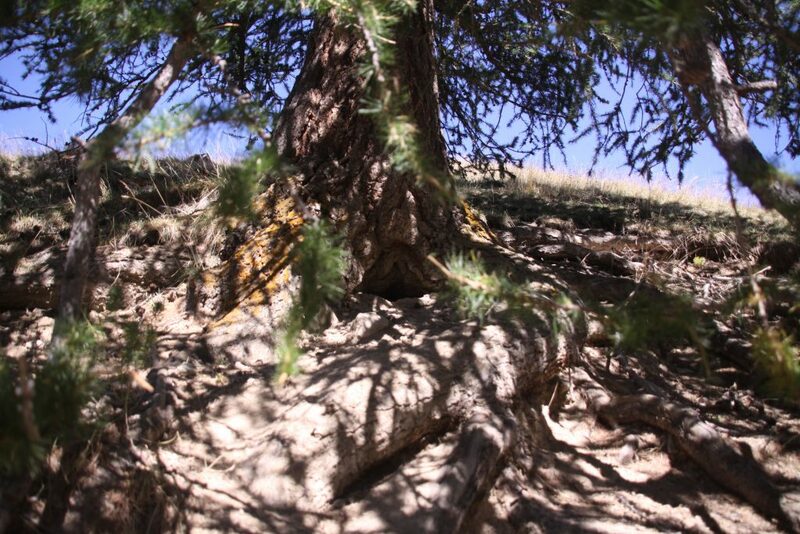 And obviously on the bottom of this tree, there was a marmot burrow hole. We thought that was just too cool. Most burrow holes are just in the middle of the landmass, but this felt like a “special hole”. Our main character is not a special marmot, it’s not a hollywood leader, chief of the marmot clan or anything, but still… it’s our hero, right? It’s not just any marmot, its ZeMarmot! So we wanted to give him a special burrow. 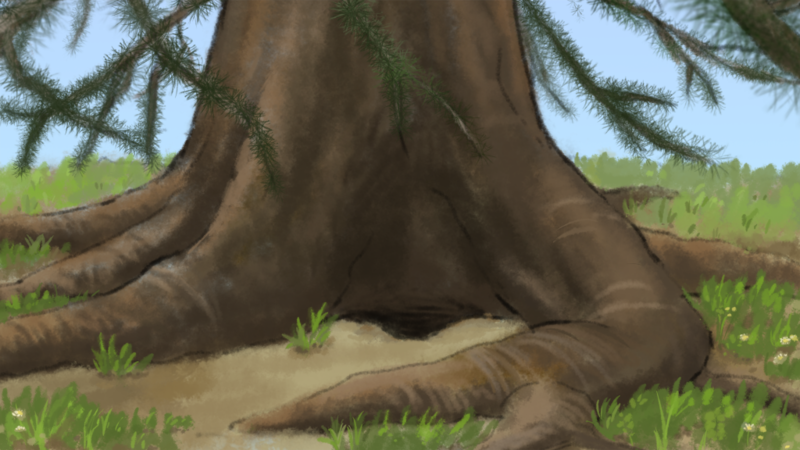 Therefore ZeMarmot now lives under a cool tree. Only difference is that we didn’t set it on a hill but in a plain, since plains are also very common setups for marmots in the alps. Note that this last image is still work-in-progress. Aryeom said she is not fully happy with it yet. I thought it was still nice to show you the progression from our research photos to storyboard sketchs, drawing and coloring, with all the thinking we made on why and what. While production on the animation is still going full-steam, we thought we could show what exactly this is about. How do you go from static images to animated ones? Well this is all like progress layers, one step after another. We have already talked about these at length so we won’t do it again. Feel free to check out our previous blog posts on the topic. These are the first 2 layers: comics-like static images (storyboard), and static images displayed in video (animatics). This definition is a little too “mechanic” and tied to modern way of animating with vector or 3D (actually it is not entirely true even in 3D and vector but this is what one might think when discovering interpolation magic). Key frames are actually simply “important images” as determined by the animator in a purely judgemental way. Keyframing is part of the art of the animator, more than a science. It is true that they are often starting/ending points of movements, but this is not a necessity. Also called sometimes “key poses”, these are what the animator feels make the movement good or not, in one’s guts as an artist. 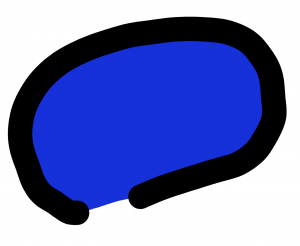 When animating, there are 2 main techniques. The first method is to decompose the movement in key poses (keyframes) as a first step. Then later, when it looks good, you complete with intermediate frames (inbetweens). This is the pose to pose method and demonstrated a bit in the above video. When you are a big studio, keyframes would usually be drawn by the main animators, and the inbetweens would be left to the assistants (less experienced animators). This allows to share the work with more multitasking. In ZeMarmot‘s case unfortunately, Aryeom does everything, since we don’t have the funds to hire more artists as of yet. The other method is called “Straight Ahead” and consists on doing all frames one after another without prior decomposition. Timing is much harder to plan with such a technique and you may end wasting more drawing. On the other hand, some animators prefer the freedom it gives and by making movements less perfect, you can also avoid them being too mechanical (in other words, perfect movement are not always what you are looking for when you want to represent living being in their whole perfect imperfection). Observing Aryeom, she uses both methods, depending on the cuts, as is the case for many animators. Hopefully you appreciate this insight on the work behind animating life, and this small video where we display the same pieces of a scene at different steps in the work-in-progress, first one after another, then side by side.